Well, maybe. But that brings to mind the classic quote from mid-19th century Republican pol Simon Cameron (our pic du jour): "An honest politician is one who, when he is bought, will stay bought." 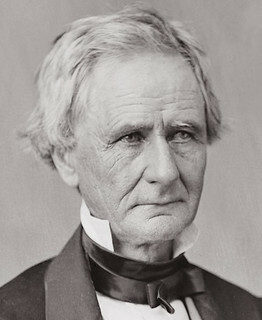 Cameron was nominated for President, but gave his support to Abraham Lincoln at the 1860 Republican National Convention. Lincoln, as part of a political bargain, named Cameron Secretary of War. Because of allegations of corruption and lax management, he was forced to resign early in 1862. His corruption was so notorious that a Pennsylvania congressman, Thaddeus Stevens, when discussing Cameron's honesty with Lincoln, told Lincoln that "I don't think that he would steal a red hot stove." When Cameron demanded Stevens retract this statement, Stevens told Lincoln "I believe I told you he would not steal a red-hot stove. I will now take that back." Were pols really so much more clever with insults back then? I’d like you to consider an idea that I’ll call “the fine-tuned liberal democracy.” It begins by looking backward a few million generations and tracing our ancestry, from tree-dwelling apes to land-dwelling apes, to upright-walking apes, whose hands were freed up for tool use, to larger-brained hominids who made weapons as well as tools, and then finally to homo sapiens, who painted cave walls and painted their faces and danced around campfires and worshipped gods and murdered each other in large numbers. When we look back at the ways our ancestors lived, there’s no getting around it: we are tribal primates. We are exquisitely designed and adapted by evolution for life in small societies with intense, animistic religion and violent intergroup conflict over territory. We love tribal living so much that we invented sports, fraternities, street gangs, fan clubs, and tattoos. Tribalism is in our hearts and minds. We’ll never stamp it out entirely, but we can minimize its effects because we are a behaviorally flexible species. We can live in many different ways, from egalitarian hunter-gatherer groups of 50 individuals to feudal hierarchies binding together millions. And in the last two centuries, a lot of us have lived in large, multi-ethnic secular liberal democracies. So clearly that is possible. But how much margin of error do we have in such societies? Well, nobody knows for sure. Haidt gives a number of reasons for pessimism. And I'd quibble with some of his details. But his lecture is very much worth your time. “Furthermore, ISPs should not be able to charge more for certain content,” Zuckerberg intoned, though part of his $523 billion company’s revenue comes from throttling the reach of publishers’ content unless the publisher pays Facebook to show their content to people who signed up to see it anyway. The Babylon Bee bills itself as "Your Trusted Source For Christian News Satire", and I think I will check it out. If Trump is indeed a tyrant, he is a tyrant of the mind. And how potent is the control he exerts over Rubin’s. So sharp and so sudden are her reversals as to make effective parody impossible. When President Obama agreed to the Paris Climate Accord, Rubin left her readers under no illusions as to the scale of her disapproval. The deal, she proposed, was “ephemeral,” “a piece of paper,” “a group wish,” a “nonsense” that would achieve “nothing.” That the U.S. had been made a party to a covenant so “devoid of substance,” she added, illustrated the “fantasy world” in which the Obama administration lived, and was reflective of Obama’s preference for “phony accomplishments,” his tendency to distract, and his base’s craven willingness to eat up any “bill of goods” they were served. At least it did until President Trump took America out of it, at which point adhering to the position she had theretofore held became a “senseless act,” a “political act,” “a dog whistle to the far right,” and “a snub to ‘elites’” that had been calibrated to please the “climate-change denial, right-wing base that revels in scientific illiteracy” (a base that presumably enjoyed Rubin’s blog until January 20th, 2017). To abandon the “ephemeral” “piece of paper,” Rubin submitted, would “materially damage our credibility and our persuasiveness” and represent conduct unbecoming of “the leader of the free world.” One is left wondering how, exactly, any president is supposed to please her. I think the answer to that last bit is "Be named Mitt Romney." I used to read Ms. Rubin's blog, but tuned out due to a combination of her shrill content-free invective and the painfulness of the WaPo paywall.